1. Satan works with all deceivableness (2 Thess. 2) in these last days and a literal mark like a microchip or a literal image like a statue is no deception whatsoever. 2. Once you find out who the first beast is, you will know what the 'image' to that beast will be, and it will not be a statue or anything of that kind. So who is the first beast of Revelation 13? If you take a look at THIS ANTICHRIST PAGE, you will see that the first beast is the Roman Empire in it's PAPAL form. And what is the main feature about the Papacy? It is a union of church and state, with the church directing the affairs of the state, which is the picture we also see in Revelation 17, with that 'mother of harlots', the Roman Catholic Church, 'riding' (controlling) the beast. And that very unholy union has caused the enforcement of religious laws and the persecution of MILLIONS of God's people throughout history. So the IMAGE of the Papal beast will be a 'Church and State Union', with the church telling the state what to do, 'speaking' and enforcing 'religious laws' upon the people - the mark of the beast! And which nation will bring about the image of the beast? The second beast of Revelation 13 which is AMERICA! We have already given a clue as to what the image is above. If the Papal Church of Rome is the first beast in Revelation 13, then the image is naturally going to be the image of the Papal Church. Let's find out exactly what it is. We need to build up a little background first before getting to the image of the beast. In the 14th century the great protestant reformation was started by a man named John Wycliffe, who wrote the first English Bible for the common people, to be able to read the Word of God themselves. And then the reformation got into full swing in 1517 when Martin Luther nailed his 95 Thesis to a Roman Catholic Church in Wittenberg, Germany. Throughout the years to follow, the Protestant reformation continued and strengthened with Calvin, Knox, Wesley, Cranmer, Zwingli and many others. Now the reason for the Protestant reformation was because the Roman Catholic Church had blinded the world with her false doctrines, traditions and pagan practices. And had ENFORCED her dogmas upon the world for 1260 years. But God still had a remnant people throughout this time and then God led certain men like Wycliffe, Tyndale and Luther to expose the great error in Roman Catholic doctrines. These great men of faith proclaimed that we need to base our beliefs solely upon the Word of God, rather than upon the traditions of men - this became known as 'sola scriptura'. And no, Luther and others did not come to the full truth of the gospel, but God used them to begin shining the true light around the world. To counter this reformation, the leaders of the Roman Church started an order known as the Jesuit Order in 1534, and decided to commission Catholic Jesuit priests to re-interpret Bible prophecy in order to take the focus off the Roman Catholic Church as antichrist, which the reformers revealed. Please note, history records that the Roman Catholic Church has tortured and killed at least 50 million people. Now a huge blow came to the Roman Catholic Church, when in 1798 General Berthier marched his French army into Rome and took the pope captive, where he later died. "In 1798 General Berthier made his entrance into Rome, abolished the papal government, and established a secular one" (Encyclopedia Britannica 1941 edition). This put an end to the Papal rule which spanned from 538 - 1798, a total of 1260 years. This "deadly wound" to the 'Papal head' of the first beast was prophesied in Revelation 13. But the same chapter also prophesied the "healing" of the deadly wound. 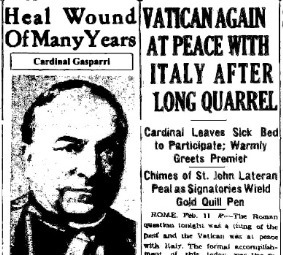 That deadly wound began it's healing in 1929 when Mussolini signed an agreement with the Vatican giving them once again CIVIL POWER! And since then, the Papal Church of Rome has been growing in strength, by making agreements and securing the support of the nations of the world. In 2018, the Vatican had "diplomatic relations" with 183 of the 192 UN world states, and that number is growing all the time. So before long, the Roman Catholic Church will have the support of the whole world! The majority of Protestant churches didn't make a complete break from the Roman Catholic Church, because they held on to some of her doctrines. For instance, the majority of Protestant churches still hold onto the error taught by Rome like the false Trinity god and keeping Sunday as the Sabbath day. And we now even have many of the Protestant churches fully reuniting with the Papal Church through this ecumenical movement. Just look at the following news quote from 1999. Let's just think about this for a moment. The church leaders are now trying to say that tens of millions of TRUE Christians who obeyed the Word of God over Roman Catholic Church tradition, and who died for that true faith they found, was a MISUNDERSTANDING!!?? Let me tell you what it was. It was Satan using the Roman Catholic Church to persecute anyone who believed in the True Word of God and wanted to live by it. There was NO misunderstanding on the part of the Christian martyrs who would rather die than bow down to Roman Catholic heresy. You will also notice in the above quote that this union between the Lutheran Church and the Catholic Church has paved the way for the other Protestant Churches to unite with them, and it is only a matter of time before there is a full union. THIS will then pave the way for the image of the beast to be fully setup and ready to "speak". And now in 2017, we have the majority of the once 'Protestant' churches involved in ecumenical relations with Rome! By the way, the term 'Protestant' has been dropped by the majority of professed Christians in America and have replaced it with 'evangelical'. This is because they no longer see themselves as 'protesting against Rome'. Instead they are JOINING with her again! The "earth beast" which "says to them that dwell on the earth that they should make an image to the beast" is America (see America in Prophecy). So the nation of America tells the people to form an image of the Papal Church of Rome. In other words, they tell the people to form a church state union in America. And this is actually progressing right now with the coalition of Protestant, Evangelical and Catholic churches in America. The different ecumenical movements like the "Interfaith Movement" and "United Religions Initiative" are bringing the churches together under one common cause, and the "terrorist" activities around the world is giving more force to ecumenism. We can clearly see just from the above quote that there is a Protestant movement (Roman Catholic by design) in America for Christians to gain civil power and impact the laws of the land. And this is known as the "Catholicization of America", which the Roman Catholic Church had planned since the Christian pilgrims went to the New Land to escape the persecution of the Papal Church. And today we are seeing this happening. Just look at this union between Trump and the Evangelicals. Those Evangelical leaders are the one's directing Trump on many policies! In 2004, for the first time, Roman Catholic and Evangelical Churches join in a new alliance! What a statement! Protestants don't see Catholicism as different from their own faith. And yet America was built upon the very people who were ESCAPING Catholicism! The Papal Church of Rome is a religious/political institution and during the dark ages it enforced it's own laws through the nations that supported her. In the same way the Protestants of America will cause the President to enforce religious laws, 'speaking and causing' the world to take the mark of the beast. With Donald Trump as president today, we are seeing a uniting of church and state like never before in America. The 'evangelical' leaders have direct access to the president, which they never had before. Revelation 13:12 says that the second beast 'exercises all the authority of the first beast in his presence, and causes the earth and those who dwell in it to worship the first beast.' 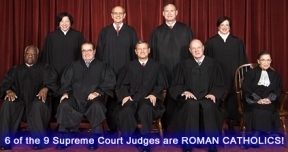 If the United States is to exercise all the authority the Papacy had and force the world to worship the Papacy, then it follows that America will become like the Papal Church of Rome was during the 1260-year period when she enforced her doctrines through the law and persecuted anyone who would not submit. America will one day soon enact papal laws and enforce their observance internationally. The "speaking" of the image is the act of enforcing civil laws, which the Protestant churches are seeking now and will soon be able to accomplish. Is there any law that the Roman Catholic Church and many of the Protestant churches are seeking to bring into force? Yes, the Sunday law. There is a great effort being made by Rome and many Protestant churches to make Sunday a holy day and to enforce it by law. Once this is accomplished through the civil powers, we will see the mark of the beast in force and Revelation 13 will be fulfilled. NOTE: The majority of churches today have already united with the governments of the world, in securing their 'tax exempt' status. Through this act, the churches have united with government, rather than uniting wholly with God. Please do not join this ecumenical movement, but heed God's call to Come out of Her My People. Study the Word of God for yourself and stand firm on the truth, no matter what. This image of the beast will seem like a good thing when it is fully formed and it will deceive the majority of people, because Satan is the one behind it, and he is the master deceiver, trying if possible to "deceive the very elect". But stay separate and make a stand with God's end time remnant church.